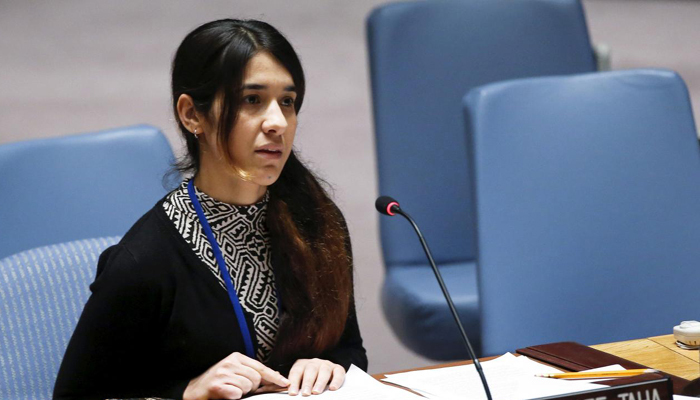 Nadia Murad survived the worst of the cruelties and brutality inflicted on her people, the Yazidis of Iraq, by the Daesh group before becoming a global champion of their cause and a Nobel Peace Prize laureate. Murad, who was taken hostage by Daesh in 2014 but escaped, is the first Iraqi to receive the prestigious award. The 25-year-old won the Nobel in October alongside Congolese doctor Denis Mukwege for their “efforts to end the use of sexual violence as a weapon of war”. “For me, justice doesn´t mean killing all of the Daesh members who committed these crimes against us,” she said shortly after winning, using an Arabic acronym for IS. The slender, dark-haired woman once lived a quiet life in her village in the mountainous Yazidi stronghold of Sinjar in northern Iraq, close to the border with Syria. But when the militants stormed across swathes of the two countries in August 2014, her nightmare began. Daesh fighters swept into her village, Kojo, killing the men, taking children captive to train them as fighters and condemning thousands of women to a life of forced labour and sexual slavery. Murad was taken by force to Mosul, the Iraqi “capital” of the Daesh’s self-declared caliphate, where she was held captive and repeatedly gang-raped, tortured and beaten. Daesh fighters wanted “to take our honour, but they lost their honour”, said Murad, now a United Nations goodwill ambassador for survivors of human trafficking. Like thousands of Yazidis, Murad was sold and forcibly married to a militant, beaten and — in contrast to the official wives of Daesh leaders — forced to wear makeup and tight clothes, an experience she later related in front of the United Nations Security Council. Using false identity papers, she managed to cross the few dozen kilometres (miles) to Iraqi Kurdistan, joining crowds of other displaced Yazidis in camps. Since fleeing, Murad has dedicated herself to what she calls “our peoples’ fight”. She and her friend Lamia Haji Bashar, joint recipients of the EU´s 2016 Sakharov human rights prize, have advocated to reveal the fate of 3,000 Yazidis who remain missing, presumed still in captivity. The Yazidi cause has won a high-profile supporter — Lebanese-British lawyer and rights activist Amal Clooney, who also penned the foreword to Murad´s book, “The Last Girl”, published in 2017. Yet in contrast to all the tragedies that have befallen her, recent pictures on Murad´s Twitter feed show happier times.